Kuppies –In this festive season gift your loved ones something special and real that will definitely delight your taste buds. Kuppies, introduced its great new cupcakes or delectable Brownie. The Brownies are here are even tastier than other Bakeries.You will be shocked to know that you can get such yummy brownie for just 18RS/piece. Kuppies is a Dessert Brand based in Delhi/NCR, India, which sells packaged snack cakes & similar desserts directly to consumers through hypermarkets, supermarkets and convenience stores, as well as supplies to fast-food restaurants. Kuppies has a dedicated team who are led by founders Jeevash Vaid, successful entrepreneur and business owner, and Uni Vaid, trained culinary and pastry designer from the USA. She was ranked among the top five bakers in New Delhi in 2014 and has received numerous award and accolades for baking Delhi’s best cheesecakes, cupcakes and other goodies and treats. It is a brand which supplies to CAFÉ COFFEE DAY and CHAYYOS Costa Coffee, Big Bazaar, Wal Mart, Spenser, 24×7, Easy Day, Big Basket and more. Also, It has many other such outlets all over India. Kuppies offer some cakes that are exclusively available at chaos and other such outlets. Their cakes like blueberry, with real fruit and deep filled flavor splash. 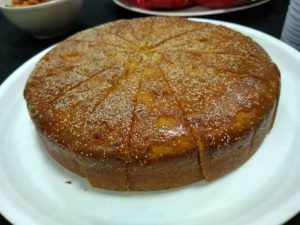 Banana cake, for all those health lovers who loves to have tasty food are just amazing. The amazing designs of the cakes will glitter up your eyes. GAJJAR KA HALWA cake, directly from Indian kitchen with real stuffed carrots. You can directly order your cakes from big basket or grab them from nearby grocery store. They will be always delicious. Kuppies has introduced a 100% Vegetarian Brownie with Dark Choco Chips. A delicious, chocolaty and heavenly Brownie for its customers at an extremely affordable retail price. It is a cross between a cake and a soft cookie in texture and for the very first time being launched in the Indian FMCG market. The Brownie is made with Imported Real Dark Cocoa solids to give an intense chocolate hit burst in your mouth way ahead of any sweet or dessert snack available in the market. The Brownie is Fudgy while Moist in texture and has plenty of Choco Chips, which adds a Chocolaty richness to the Brownie. Vegetarian eaters can also enjoy it without a worry as it is 100% Eggless. This Brownie has been developed specially for the Indian climate and environmental conditions. The Brownie retains moisture, despite external environmental conditions and stays fresh for sixty days. The taste of this Brownie won’t leave your mouth quickly. The flavor will linger for several minutes after you finish and would satisfy all your chocolate cravings. 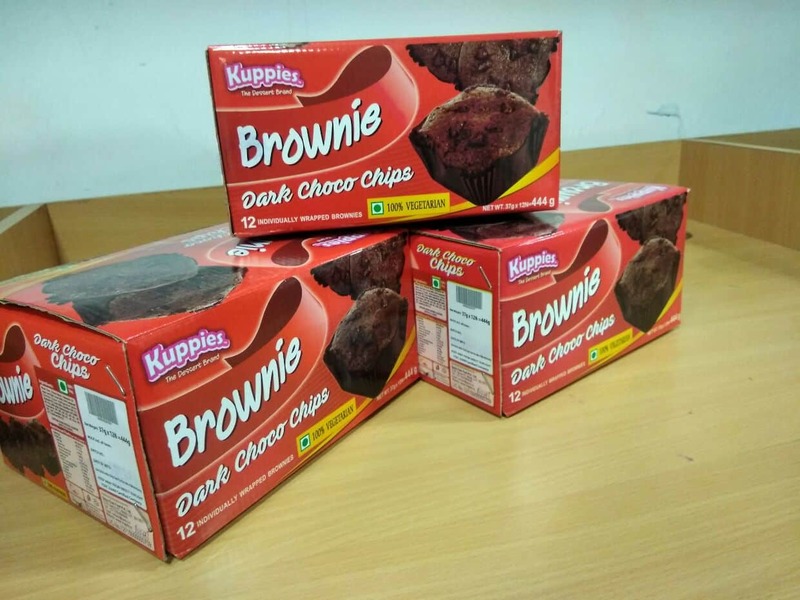 Kuppies Brownie with Dark Choco Chips is well wrapped in single-serve packaging providing flexibility to a consumer to enjoy as per convenience. Each piece weighs around 37 grams with 12 Delicious individually packed Brownies in each Box. Nitrogen is flushed into each Brownie Pouch before sealing it to ensure freshness and longer shelf life. The three-layer packaging protects the Brownie from contaminants. Each wrapper is labeled with complete ingredients and nutrition facts all as per FSSAI guidelines. Ingredients: Wheat flour, Filtered Water, Palmolein oil, Sugar, Corn Flour, Cocoa Solid, Dark Compound Chocolate, Milk Solids, Raising Agent (INS 500ii), Preservatives (INS 200,INS 202, INS281, INS 282), Salt, Emulsifiers (INS 471,INS 472e, INS 477), Stabilizer(INS 412), Contains Added Natural and Nature Identical Flavor. Storage: Packages should be stored in ambient temperature out of direct sunlight. Shelf life: 60 days from the date of manufacturing. VERDICT : Celebrate your happiness with your love ones with something sweet. kuppies provides you the best brownies which you will definitely love to have again and again, Visit your nearest outlet and grab the amazing delectable sweets.